Preheat the oven to 325°F. Arrange an oven rack in the center of the oven. 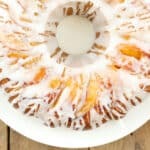 Thoroughly grease a 10 cup bundt pan and arrange the peach slices in the bottom of the pan. Beat the butter and sugars together, on medium speed, until fluffy crumbs form. Add the eggs, vanilla, and almond extract, beat again until smooth. Add the milk, beat on low speed to combine. Add the flour, baking powder, salt, and cinnamon. Beat again, just until combined. Pour the batter over the peaches in the greased bundt pan. Bake for 60 minutes, until deep golden brown. Cool in the pan on a wire rack for 20 minutes. After 20 minutes, place the cooling rack on top of the cake, hold the sides firmly and invert the pan over the rack. The cake should drop smoothly out of the pan. Tap firmly on the pan with a wooden spoon, if necessary to free the cake from the pan. Let the cake cool completely. Whisk together the glaze and drizzle over the cake. The frosting will harden as it cools. Store at room temperature, loosely covered, preferably not airtight. This cake will keep nicely for 2-3 days. Enjoy!